Just when you think you have a handle on everything, the handle slips out of your hand and you fall. Ten months down in 2013. Two left to go. I've spent this last year trying to focus on the word ACT--acting with purpose, controlling my reactions, and training my actions to serve others around me. I had more downs than ups this past month, but I think I learned more about this complicated word during October than I have in any other month of 2013. A dear friend experienced the loss of her twin boys this month. While it is not my place to tell her story, I would like to share a few things with you. I firmly believe that God uses us as angels on this earth to help those who are hurting. Twice I thought to act in ways that weren't my own thoughts. I had spent the entire afternoon writing this post, anxious to hear what would happen with the babies. 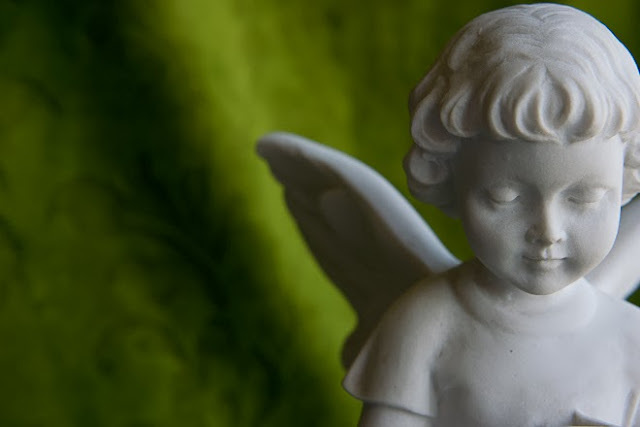 My mind was flooded with memories of my own loss, and suddenly I remembered a short list of things I wish I had known before losing my baby--things I wanted Heather to know before it was too late. Twice I was prompted to send a text, and twice I dismissed the idea, fearing to intrude at such a private and difficult moment. Finally the idea came a third time, and I decided that it was better to be inopportune than to be too late. I sent the text. I later found out that I was just in time. A few days later, my family was preparing to go out of town for the weekend, and I felt like I needed to stay home one more night before joining them. As it turned out, Heather's mother called me the evening that my family left, asking me if I could play a musical number for Church, since she was leaving town to be with her grieving daughter. We talked at the door for a few minutes when she dropped off the music, and as she left I realized that if I had left with my family, I would have been unable to help. Sometimes, thoughts come to our minds and we wonder, "Is this thought my own or is it from God?" And even more rarely do we get confirmation that we were acting as His hands here on earth. I experienced something this last month that I haven't faced in a long time. I got into a full-fledged funk that lasted almost two weeks. I couldn't make myself do much of anything. I couldn't make myself get up early like I did for the entire month of September. I went to my yoga classes, but I couldn't make myself do yoga on my own. I couldn't muster the energy I needed to do my homework. I couldn't force myself to make to-do lists or even stay on top of my cleaning or scripture study or prayer. Funny how this behavior is a surefire downward spiral into the land of "feeling worthless." I would crawl into bed each night, reflect on my day and feel like I had done even less than the day before. I was miserable on the inside and trying to keep it all together on the outside. 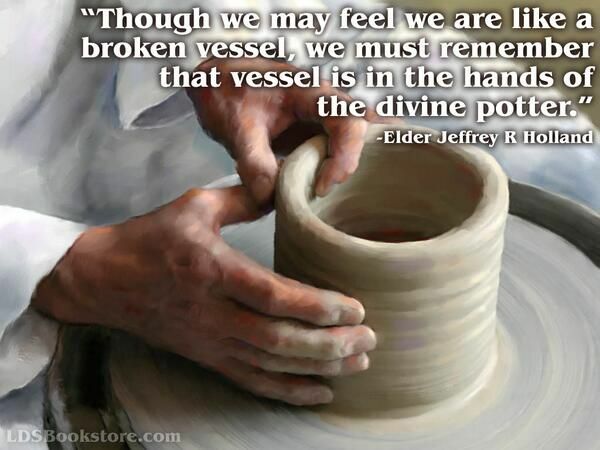 I thought back to Elder Jeffrey Holland's talk just a few weeks ago--Like a Broken Vessel. How he said, "if the bitter cup does not pass, drink it and be strong." I knew what I needed to do to bounce back into the joy of my regular life; I just needed to make myself do those seemingly insignificant but perspective-altering small daily things that make all the difference. I needed to reacquaint my body with my spirit. Little by little I wriggled myself back to where I know I need to be. I'm sure it will happen again, but I learned that losing my focus on acting with purpose can have a devastating effect on my self-esteem. Mothers are supposed to be the teachers and kids are supposed to be the students, right? The greatest lesson I learned this month (maybe even all year) I learned from Ben. Ben took the ACT (appropriately enough) last June. He got a great score, but he didn't finish the math section, and he knew he could do better, so he decided to take it again on October 26th. He took a prep course and studied for the test as often as he could find the time. Friday night was Homecoming, and because he was taking the ACT at 8 am the next morning, he came straight home from the dance to get some sleep. By 6:30 am, he was up, showered, fed, and studying again. Around 7:15, Ben came into our room and said that he couldn't get his admission ticket to print. I headed downstairs to see what I could do, but for some reason the website wasn't recognizing his password, and customer service isn't open on Saturday. I fired off a quick email to ACT then thought I'd try to call, just in case someone was there to answer day-of-the-test questions. An operator answered, pulled up Ben's account, then told me, "We have no registration for today's test for a Benjamin Denton. I'm sorry." I screwed up. Screwed up big. I hung up the phone and then turned to share the horrible news with my son. Before the words could leave my mouth the tears stung my eyes and began to roll down my cheeks. The weight of my mistake was killing me. My son who had just spent four weeks cramming for a test would be unable to take it because I had forgotten to register him. "I'm so sorry, Ben. I must have forgotten to register you. I never forget stuff like that. I'm so sorry. I can't believe it." Not only were the tears streaming down my face, but my body began to wrack with sobs. Hyrum walked into the room and immediately walked back out again, not knowing how to handle his distraught mother. How could I have forgotten something so important? My Ben. My sweet, peacemaker son looked me in the eye, wrapped his arm around me, and instead of lashing out in justifiable anger, he tried to soothe me: "Mom, it's okay. There's nothing we can do about it now. It's okay. Really. I guess it was meant to be this way. Don't be so upset about it. It's okay. I promise." Over and over he repeated these words to me, trying to stop my tears. Not a single word of reprimand. Or anger. Or recrimination. Or disappointment. Or . . . anything. Nothing but kindness and understanding came from my son. As it turns out, Ben can take the ACT one last time (in December) before the final fall 2014 fall application deadline. As it turns out, Ben was right. It will be okay. Before he even knew he could still take the test, Ben had forgiven me for my mistake. How could he do that? I kept replaying in my mind how I would have reacted in a similar situation. I know I couldn't have mustered such control in a similar circumstance, but because of his example at that pivotal moment in his life, I now know that it is possible, and I know that, for the rest of my life, I will look back on that morning many times, hopefully mustering control and kindness and forgiveness in situations that appear unforgivable. How I was blessed to have a son like Ben I'll never know. What I do know is that he is a much better person than I in so many ways. 2013--I'm going to give you everything I've got these last two months. I'm new to your blog, but I have to say that I love this post. This is something that I struggle with - acting on promptings. Thank you for this great reminder. Love that Ben!! He IS an amazing man!! It was so fun to get to know him a little bit better when we came in September. Just think about what a great missionary, husband, and father he will be! Ben sounds like a such a great young man. Do parents have to register the test takers? Wonderful lesson in immediate forgiveness. Love that Ben!! Oh... You know how to tell a story and move your readers. I love your transparency. I have learned to say I'm sorry to my growing children...and they are teaching me to offer forgiveness. Sweet post! Oh my friend, I've been where you are so many times. And good for you that you've fought your way back. Forgiving children are a miracle - I have sons like that (and a daughter) and I don't know where I'd be without them. I, too, believe that we do angels' work here. I believe we are prompted all the time to do things we would never think of on our own. Our Heavenly Father is closer than we think. What an interesting post, Jen. Really got me thinking. love that Ben was more concerned about his mom's feelings than that test. Sons are wonderful, and it just keeps getting better as they get older.